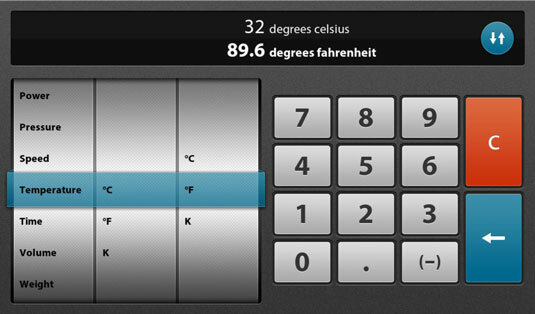 You can perform simple conversions with the Unit Converter calculator on the BlackBerry PlayBook, like figuring out that 100 km/hr is not quite as fast as it sounds, equaling only 62.137 mph or a mere 53.996 knots on the water. Angle. Degrees, gradians, and radians. Area. Square area for millimeters, centimeters, meters, kilometers, inches, feet, yards, miles, hectares, and acres. Data. Bits, kilobits, megabits, gigabits, terabits, bytes, kilobytes, megabytes, gigabytes, and terabytes. Length. Millimeters, centimeters, meters, kilometers, inches, feet, yards, and miles. Power. BTU/min, ft lbf/min, ft lbf/sec, horsepower, kW (kilowatts), W (watts), and Nm/s. Temperature. Centigrade, Fahrenheit, and Kelvin. Time. ns (nanoseconds), s (microseconds), ms (milliseconds), seconds, minutes, hours, days, weeks, and years. Volume. cu in (cubic inches), cu ft (cubic feet), cup, US fl oz (US fluid ounce), gal (Imp), gal (US), liters, cubic centimeters, cubic meters, pt (Imp), pt (US), qt (Imp), qt (US), tbsp (tablespoon), and tsp (teaspoon). Weight. mg (milligram), g (gram), kg (kilogram), t (ton), oz (ounce), lb (pound), and st (stone). The weight conversion identified as tons appears to refer to metric tons, although it isn’t identified as such in the original release of the BlackBerry PlayBook operating system. And in any case, the calculation for tonnage doesn’t precisely match a conversion into U.S. pounds.